“Knee play” is the opening piece of Einstein on the Beach, Philip Glass’s famous opera (1979). For an extensive explanation of “knee plays” and namely knee play 1 and its random numbers, please check Nicolas Sceaux’s page. 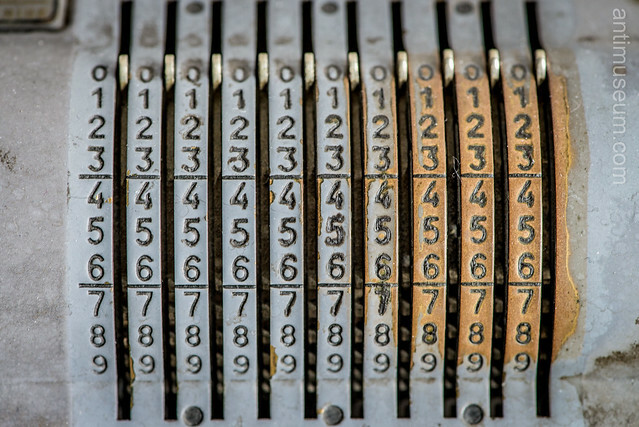 This is a close-up of my old Swedish computing machine, a pre-computer model from the 1950s which works, like Pascal’s calculator by adding and substracting numbers, hence enables one – through complex shifting mechanisms – to multiply and divide too. I used to be able to compute faster with this machine than typing on an electronic calculator. Please note that I’m not that old, I got that machine when I was 18 or so, and it used to be a sort of game for me to compare how fast one could use it. You are now entitled to listen to Knee Play 1. Don’t forget to buy the record!